For every 100 men in leadership positions at the managerial level and above globally, there are fewer than 40 women in positions of a similar level. In Asia Pacific, the ratio falls to around 25 women for every 100 men. 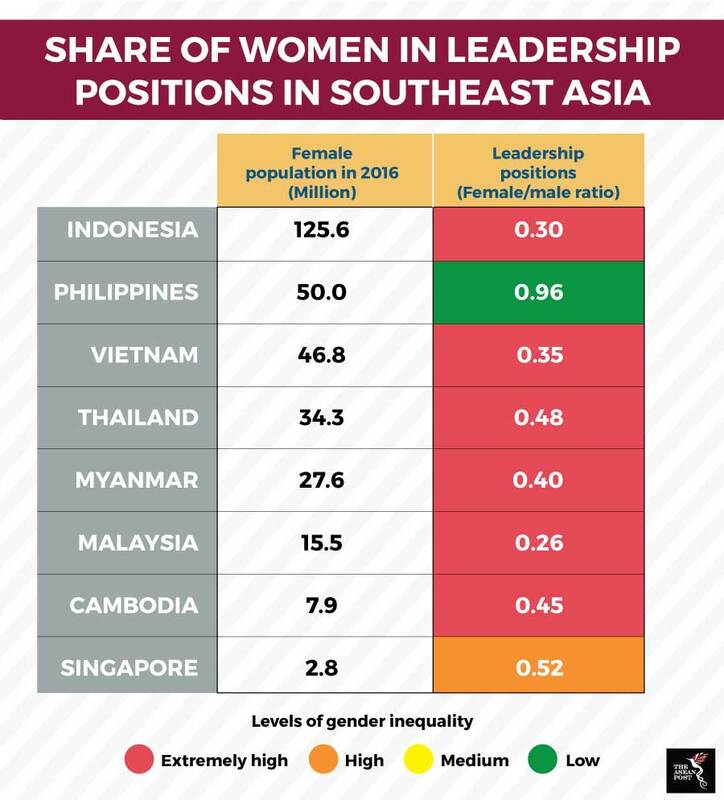 The average ratio of women to men in leadership positions in the Southeast Asian region is at 46 to 100. Overall, the level of women in leadership positions is low throughout the region, with the exception of the Philippines. In Malaysia, the region’s worst performer for the ratio of women to men in managerial level positions and above, the figure is only at 26 women for every 100 men. Categorised as having an extremely high level of gender inequality for this indicator by the McKinsey Global Institute in its publication ‘The Power of Parity: Advancing Women’s Equality in Asia Pacific’, Malaysia is followed by Indonesia at 30 women to 100 men, Vietnam at 35 women to 100 men, Myanmar at 40 women to 100 men, Cambodia at 45 women to 100 men, and Thailand at 48 women to 100 men. Singapore, with its 52 women to every 100 men in leadership positions, is one of two countries in the region categorised as having a high level of gender equality in leadership positions. The regional best, the Philippines, outperforms most countries globally at 96 women in leadership positions to every 100 men at a similar level. Gender equality in leadership positions at managerial level and above is one of the indicators used by the publication to estimate the achievement of gender equality at work. Other indicators for gender equality at work are female to male ratio in labour force participation, professional and technical jobs, perceived wage gap for similar work, and unpaid care work. The Philippines, backed by its traditionally matriarchal and egalitarian society consistently outperforms its neighbours in all other gender equality at work indicators, except for labour-force participation, which is dominated by Myanmar at 93 women for every 100 men. The Philippines recorded only 64 women for every 100 men in the labour force. However, the McKinsey report noted that the standing of women in the Philippines still depends heavily on their income level, which means women with lower income have inequal access to education and opportunities compared to women in a higher income bracket. The scope for improvement for the country would be to close the considerable gender gaps experienced by its women in lower income communities. According to Dr Michael Daniels, Assistant Professor at the Canadian University of British Columbia, Asian countries can emulate the Philippines’ model for nurturing gender equality through actions taken by governmental and regulatory players, businesses and individual leadership. Daniels, in his article published by the Human Capital Leadership Institute, said that at the government level, the Philippines displayed progressive policymaking for gender equality in the form of a quota mandate for women in government jobs, as well as empowering the state to take measures to encourage gender diversity in the private sector. These are further supported by an enabling environment for women to succeed at work in a traditional Asian family set-up created through offering of flexible working hours and family-support programmes like onsite day care, as well as other women-focused skill-building programmes, mentorship programmes and quotas in senior positions. “This starts at the top of the organisation. It is not enough for a company to institute policies and objectives related to gender diversity; individual leaders need to lead by example by fairly considering women for senior roles and treating them as equals to men. In many cases, male leaders may not even be aware of their own biases, so programmes that focus on unconscious bias training should be utilised to remove old stereotypes and promote the tremendous potential of women in Asia,” wrote Daniels. While conditions in each member country is different and requires adaptation to the measures, the Philippines’ neighbours certainly can learn from its success in gender equality. In its Strategy 2020 proposal, the Asian Development Bank (ADB) recognised that targets in poverty reduction and sustainable development cannot be met without harnessing the talents, human capital and economic potential of women. As it labours for balanced human and socio-economic development, Southeast Asia as a region cannot afford to not harness these assets. This article was first published by The ASEAN Post on 6 October 2018 and has been updated to reflect the latest data.